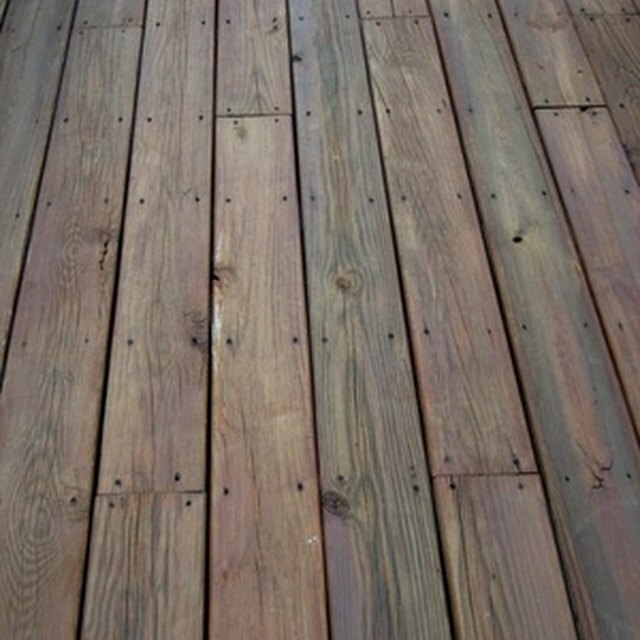 Redwood is a wood of choice for special outdoor building projects such as decks, fences, arbors and pergolas and retaining walls because it is naturally resistant to the rotting effect of elements like sunlight, wind and water. But even untreated redwood will break down faster than treated wood. To ensure the life of your outdoor structures, treat them periodically with a preservative. Treating redwood used in building projects will extend the life of the wood. Spray redwood boards with a power sprayer hooked to a garden hose. The power sprayer will remove dirt and mildew that accumulate on the boards. Read the label on the back of your redwood cleaner. Cleaner instructions vary. Some may be used straight on the wood while others must be diluted with water. Mix the product following the instructions in a bucket and swab it onto the redwood boards with a mop. The cleaner will strip the redwood of any old stain or sealant in preparation for a new treatment. Wait 15 minutes before removing the cleaner. Spray your redwood with a garden hose to remove the cleaner. Mix an EPA-registered wood preservative according to the label. Preservatives vary according to the brand and type. You may choose a preservative that has no tint to maintain the redwood's natural color or one that contains a stain to change the wood color. Swab the redwood with a mop to apply the preservative to the wood. Allow the preservative to dry before touching the redwood. Deck Doctor: What Can Harm a Deck?